This recipe is one of our family favourites! It’s a delicious winter warmer but with a little bit of a luxurious edge with the addition of half a bottle of good quality merlot (what you do with the rest is up to you but we can highly recommend indulging in a glass while you’re whipping this up! Call it chefs privilege!) 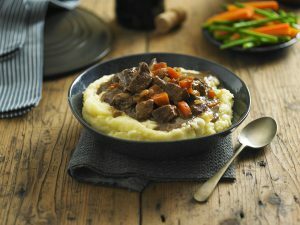 Venison is a deliciously rich meat which works really well with all the other flavours, whip this up for your next family dinner or festive get together and you’re sure to be on to a winner! 2. Add some herby dumplings (thyme flavour are good) and cook until dumplings are cooked through.